Electric blankets are a great way to cut down on energy consumption during the winter! This is because with the help of a good quality electric blanket, you are able to keep thermostats and furnaces at lower temperatures during the cold season. Finding those good quality blankets, with so many makes and models on the market, can seem daunting, though. 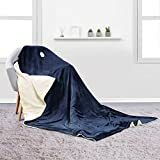 That is why we have put together this electric blanket buying guide, helping you quickly and easily choose the right type of electric blanket that will meet your needs. Under Electric Blankets: Using tie tapes, these electric blankets are placed on the mattress under the sheet and other bedding. Under electric blankets are a safe, cost effective choice. Mattress Cover Electric Blankets: Mattress cover electric blankets fit in much the same way as a fitted sheet would. 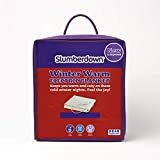 Also placed under the bedding and sheets, these blankets are a comfortable and more energy efficient way to heat up the bed before bedtime on a cold winters night. 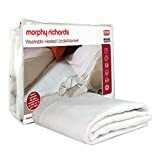 Over Electric Blankets: Either placed under a top sheet or inside a duvet cover, these electric blankets offer a little more flexibility when it comes to moving it to a living room, or taking with on a car trip, should the need arise. 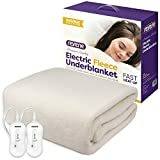 Duvet Electric Blankets: Electric duvets work the same way an over blacket would, but offer a more substantial blanket that eliminates the need to have both. With high settings for bed heating and low settings for all night use, they make a great winter accessory. 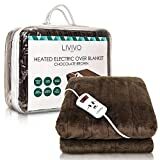 Heating: Electric blankets with varied heat settings and fast warm up are rated much higher than those that don’t offer the same heating options. 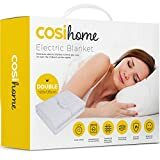 Consumers love to use high heats to warm the bed up and low heats that make it possible to keep the blanket on all night long for maximum comfort. Feel: Feel is of a particular concern to over electric blanket buyers who have bought blankets for living rooms, cars, and beds. Softer, more comfortable blankets are the most appreciated and fleece is a firm favorite with this regard. 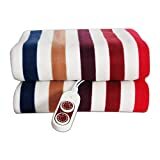 Wiring also adds to feel and comfort of the blanket and under electric blankets where wiring is not felt add a lot more comfort to the product. Features: Features favored by electric blanket owners include automatic shutoff functions and dual controls. Reviewers note that these functions add value to their purchases and well as creating extra comfort. 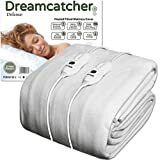 Size: Users that bought an electric blanket of an adequate size that fits their bed or allows them to wrap themselves up comfortably are much more satisfied with their purchases. Good sizing means adequate coverage and adequate coverage increases the satisfaction rating of electric blankets. What size bed do you have? 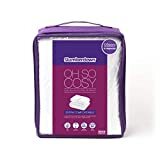 Under or mattress cover electric blankets range from twin to king size, while over blankets and duvets can be as small as a throw blanket or as large as a bed blanket. For the most comfort, choose a blanket big enough to fit your bed or needs. Electric blankets take between 60-90 minutes to warm up to optimal temperatures, however, blankets with fast heat technology are able to warm up a bed in 10 minutes. This is a convenient feature well worth investing in. Electric blankets, like regular blankets, come in varying thicknesses and weights. If you prefer heavier (or lighter) blankets, look for a heavier (or lighter) electric blanket model to ensure maximum comfort. Electric blankets are made from a variety of materials including cotton, polyester, microfibre, synthetic, and polar fleece. Cotton blankets are soft, comfortable and durable, while polyester are much easier to clean and are very strong. For added warmth and comfort needed in particularly cold circumstances, polar fleece blankets are ideal. Some electric blanket features that are worth considering include: Easy care, which allows you to detach controls to wash and put the blanket in the dryer; dual controls that allow bed companions to set the blankets to different heating settings for their own comfort; an extra foot warming feature that will make sure your toes and feet are always snug and warm; and an automatic shutoff that will make sure the electric blanket turns off if it overheats - making it much safer! 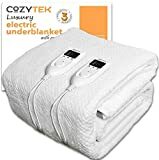 Make sure your prospective electric blanket has a UL (Underwriters Laboratories) or ETL safety mark, as this will mean it has passed all the safety regulation for the United States. 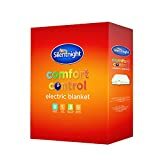 The lower the voltage of an electric blanket, the less risk of shock there will be, so it is recommended that the electric blanket you buy use no more than 120 volts. Electric blanket controls differ from brand to brand and from type to type. LCD screens and light indicators make controlling the blanket in the dark much easier, while large knobs and push buttons allow you to make adjustments with virtually no effort. Mattress cover electric blankets are stain resistant with low voltage and help protect your electric blanket from spills or pets’ accidents. Sunbeam: Well known for their Mixmaster, Sunbeam has been producing quality home appliances since 1910 and has top rated electric blankets. 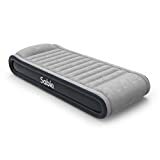 SoftHeat: SoftHeat is a heating pad brand under the Kaz company umbrella, which is a global leader in healthcare devices and home comfort products. Trillium Worldwide: With a history dating back to 1975, Trillium Worldwide, Inc. aim to produce products that improve consumers lives and are known for their heated blankets and car seat covers.